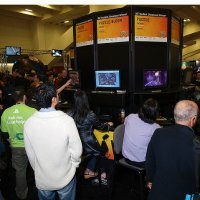 The organizers of the 13th Annual Independent Games Festival -- the longest-running and largest festival relating to independent games worldwide -- are proud to announce another year of record entry numbers for IGF 2011's Student Competition, following its submission deadline this week. In total, this year's Student Competition took in more than 280 game entries across all platforms -- PC, console and mobile -- from a wide diversity of the most prestigious universities and games programs from around the world. While 2010's content saw an impressive 193 entries, this year sees that number increase another 47% to 283 total games, making the Student IGF one of the world's largest showcases of student talent. Together with the record Main Competition entries, this year's IGF has taken in roughly 650 total entries -- the largest number in the festival's history across the Main and Student competitions. This year's Student Competition includes a number of entries from students tackling intimate personal issues through the medium of games, including Singapore-MIT GAMBIT Game Lab's Elude, a game which mirrors "the rising tide of depression, and the search for a path to happiness". Also in this vein is the University of Portsmouth team's self-reflective portrait of a single man in Dinner Date, which looks at "his desires and doubts to reflections on his friends and his place in the world" as he waits alone for a would-be romantic evening. Other titles entered include Kunsthochschule Kassel university student Lea Schonfelder's Ute, a frank, tongue-in-cheek game of sexual self-discovery from the creator of IGF 2010 Student Showcase finalist Ulitsa Dimitrova; the Myst-like adventure game Fract, from the University of Montreal, which takes place in "an abstract world built on sound and structures inspired by electronic music"; and Q.U.B.E., an austere first-person puzzle game from the University of Newport which is already garnering positive press and comparisons to Valve's Portal. Finally, this year's Student IGF competition includes two games -- Bo and Everything Can Draw -- from Shahid Ejei High School student Mahdi Bahrami, who has recently been gaining international attention through venues like Tokyo Game Show 2010's Sense of Wonder Night for his struggles to gain a foothold in the games community despite the political and economic difficulties of doing business from Iran. The above are just a small selection of the games now available for browsing via IGF.com, where you'll find more information, screenshots and video for each of the IGF Student Competition entries. Now in its ninth year as a part of the larger Independent Games Festival, the Student Showcase highlights up-and-coming talent from worldwide university programs, and has served as the venue which first premiered numerous now-widely-recognized names including DigiPen's Narbacular Drop and Tag: The Power of Paint, which would evolve first into Valve's acclaimed Portal, with the latter brought on-board for the upcoming Portal 2. Others include USC's The Misadventures Of P.B. Winterbottom (later released by 2K Games for XBLA); Hogeschool van de Kunsten's The Blob (later becoming one of THQ's flagship mobile/console franchises as De Blob); and early USC/ThatGameCompany title Cloud, from the studio that would go on to develop PlayStation 3 arthouse mainstays like Flow, Flower, and their forthcoming Journey. "With each successive year, the IGF's Student Competition has steadily become an ever-more important part of highlighting ideas and talent you don't find elsewhere in the industry at large," said festival chairman Brandon Boyer. "The submissions we get from students around the world are anything but 'amateur', and represent some of the strongest and most original voices you'll find in games. I'm happy to see the IGF showcase become an important milestone in student life, and look forward to playing through this year's record number entries!" This year's Student IGF entries will be checked and distributed to a host of notable industry judges for evaluation, before finalists are announced in January 2011, and winners awarded at the IGF ceremony during the Game Developers Conference 2011 -- part of the UBM TechWeb Game Network, as is this website -- in San Francisco next February/March.